Twisted Pine is a brewery in Boulder, CO and therefore a local beer. It is shameful that I have neglected them for so long. Hoppy Boy is an American IPA. 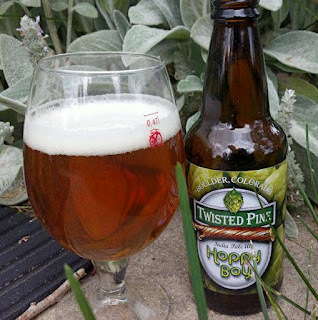 The Twisted Pine website says the beer is 65IBU and uses Cascade, Northern Brewer, and Chinook hops. Its ABV comes in at a very sessionable 6.2%. "Hoppy Boy India Pale Ale is the flagship beer of Twisted Pine. It pours a hazy pale orange and has a dry, tart taste with an earthy bitterness. Pleasant grapefruit and citrus notes are provided by the addition of Cascade hops. This classic American IPA is brewed with medium caramel malts that play off the citrus and orange rind hop flavors to make this beer most enjoyable." It has a distinct bitterness, and I do think it has an earthy flavor and aroma. I don't get as much citrus out of it as I think should be there and I am wondering if I need to stop by their brewery's tasting room and try the fresh beer. I like it. It is not the best IPA I've had in the last week or so, but it is a wonderful beer. I'm just happy to be off work and relaxing and enjoying myself. It has been a long day and a long week. Thank you Twisted Pine for a small little break. Checking into this beer on untappd got me myNew Brew Thursday (Level 8) badge. That is nice.